Welcome back for the second installment of my Labor Day vaca to Italy and Israel. If you missed my last post about Italy don't feel bad. I just re-read it and my apres-vacation depression is all over it. It was seriously hard to get back into the swing of things after this trip. Once I got home and unpacked I ate a chocolate bar and stared at my pile of dirty laundry worked out and that still didn't help. It took me awhile to muster up the energy to finally start writing again. I'll have to create my own Sasha fierce persona to use the next time any depression like that ever sets in again so that I can get back to candy blogging. Anyway, after a few days at work and seeing old friends I'm feeling better. 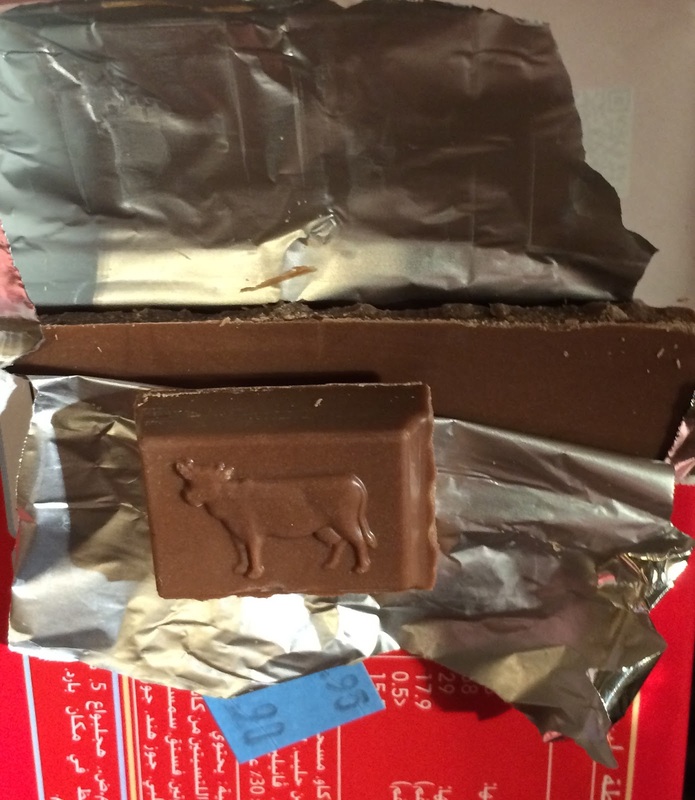 And I still have half of a two chocolate bars left from my trip to enjoy! Ok so Tel Aviv. While I did strike out a couple of times, I also discovered a few new things. 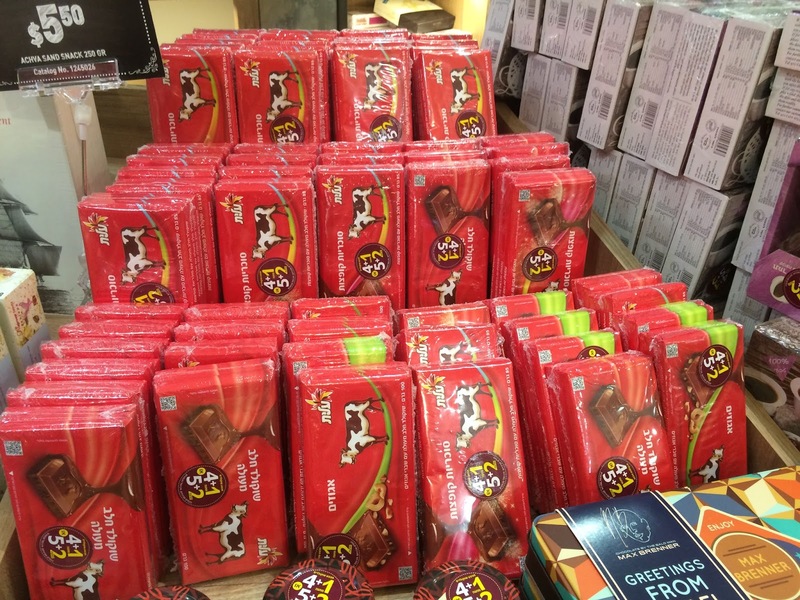 Before I left for the trip I googled best candy shops in Tel Aviv (naturally) and found a few listings. The first was a store called "Coffee and a Candy" that was described as a shop with every kind of chocolate imaginable. I took that as an invitation to eat chocolate with my morning latte but unfortunately that wasn't the deal. This store had only packaged coffee, not a coffee bar, and the chocolate was not "every kind imaginable" but rather a lot of chocolate bars from various places around the world but nothing that you haven't seen before. Not very compelling, strike 1. The next place was a store called "I Love It" which was supposed to resemble a pharmacy that "prescribes" candy. You go in, tell them what ails you, get a prescription, and then get whatever medicine (candy) that's prescribed for that ailment along with instructions for taking your medicine. Hello! Sounds super fun! The problem was that when we finally got to I Love It the store was under construction and looked out of business. Strike 2. 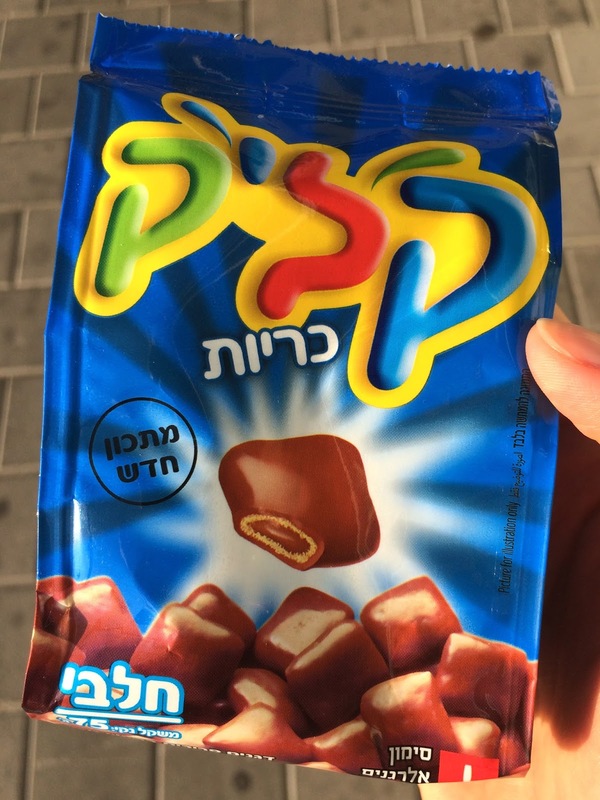 These things (whatever they're called, I can't read Hebrew) came in a variety of flavors (milk, white, dark) and either had cereal or didn't. I got the milk chocolate with cereal version. In Israel there is this chocolate cereal with a hazelnut filling inside that's very good. Covered in chocolate it was even better. I recommend this candy as a nice little chocolate-carb snack. Next were some chocolate bars. 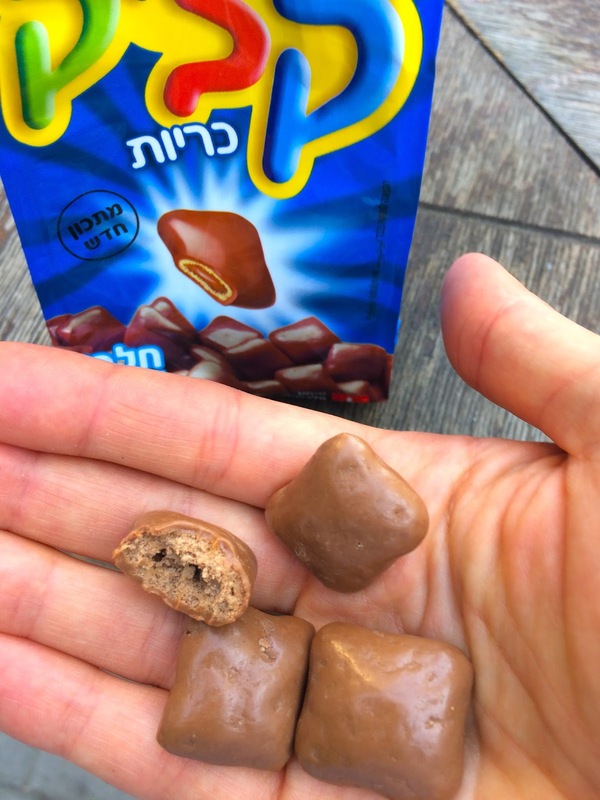 In keeping with the chocolate-of-Israel vibe I opted for one of these (again, whatever they're called). I saw them all over the city in a bunch of varieties but decided to taste the classic chocolate version. 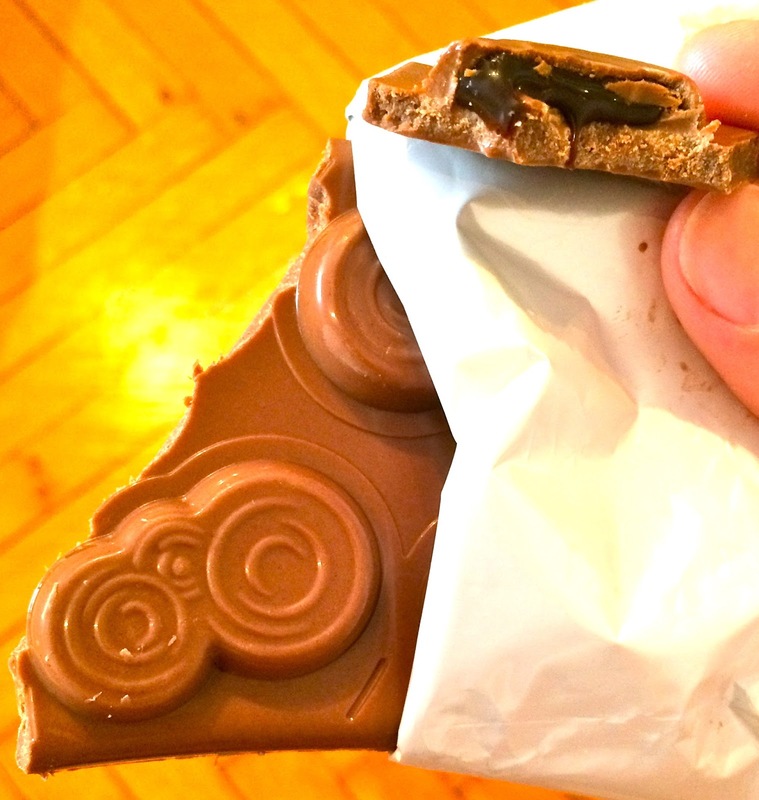 The best news is that when I got home, I saw this Milka Oreo bar in the international candy section of my grocery store (Fairway) so if you have a store near you that sells international candy then this Milka bar might be in it, waiting for you. 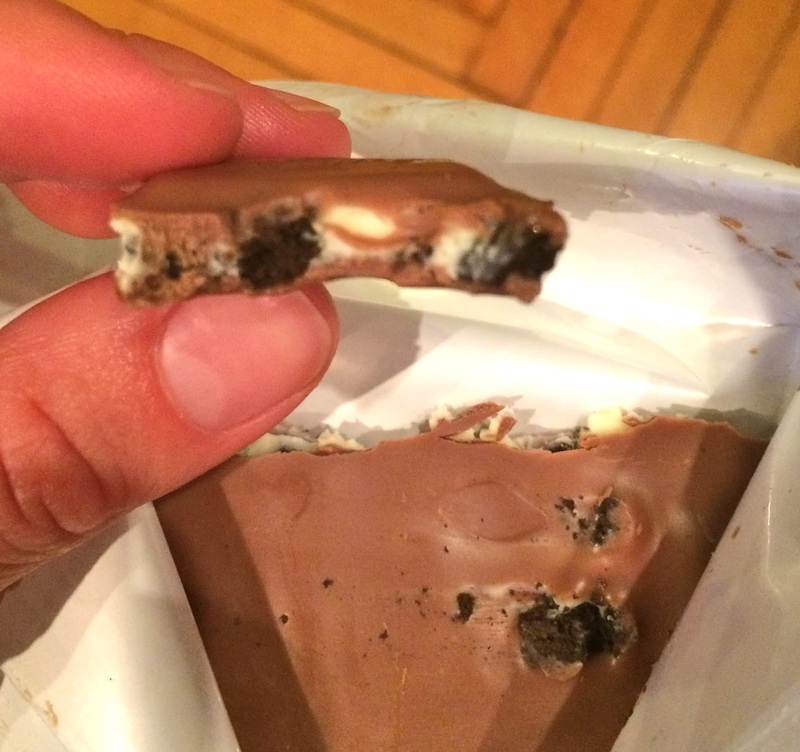 And if you don't, then you can order both of these Oreo bars on Amazon. 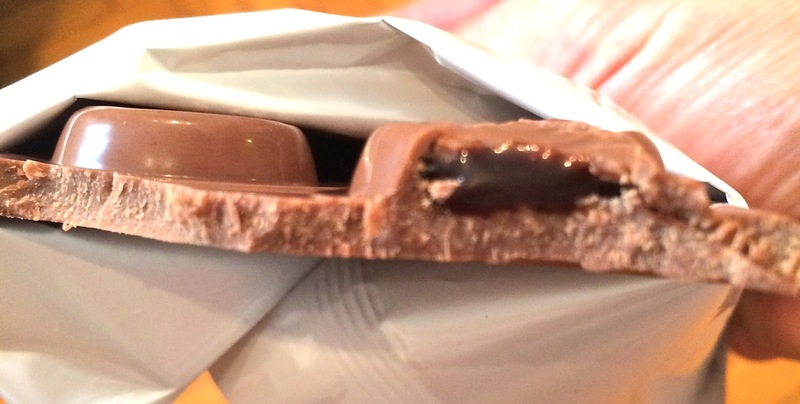 Hazelnut filled Cadbury bars?! What! I bought two. However, similar to their Oreo bar, I found that the filling was too sparse. 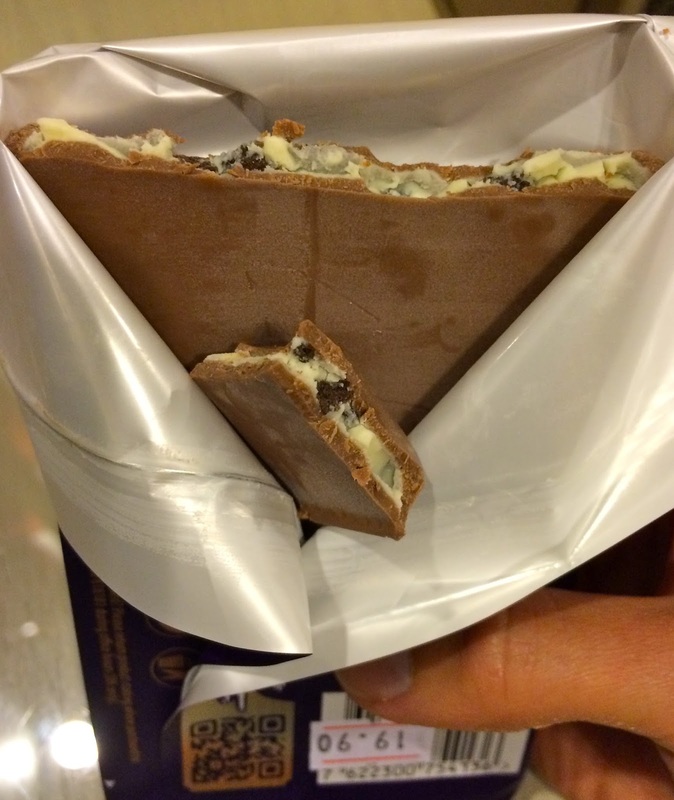 It was organized into little "puddles" which upon bite, didn't contain enough filling. The filling that was there was more syrupy than thick. Anytime something says "hazelnut filling" I'm going to assume it tastes like Nutella. I know that's my own fault and that I should really manage my own hazelnut-expectations but still, I was a little let down. That said I still ate them both (c'mon!) it's still a good chocolate bar and you should definitely try one if you two cross paths, just don't expect a Cadbury/Nutella mashup. So my aim was to tell you about Jerusalem next but this post is getting pretty long. I think I'll leave the holy city for next time and wrap up by saying that even though I initially struck out with the candy quest in Tel Aviv, the old reliable grocery store came through (as it always does). If you're looking for a new favorite abroad always check out the local grocery store. Once you do find a winner (like my Milka Oreo bar upset) be sure to scan Amazon when you get home to see if you can order more while finally doing that post-vacation laundry.